At the age of seventeen I told Jesus that my life was His to use, and I am so glad I did! I am continually amazed and humbled that God would call me to serve Him. My ministry verse is 1 Timothy 1:12“And I thank Christ Jesus our Lord, who hath enabled me, for that he counted me faithful, putting me into the ministry.” I praise the Lord that when He does the calling, He also does the enabling! When I finished college, my desire was receive further training and mentoring as an assistant before I took a senior pastorate, but God had other plans. In 2007, my wife and I got married and God closed the doors on two assistant pastorate positions and led me to minister at Grace Baptist Church in Kettering, OH while I worked a secular full-time job. Over the years, I wanted to seek a pastorate position, but God kept closing other doors and opening them at Grace. In 2009 I was hired as a part-time assistant, then a full-time assistant in 2012. After our pastor retired in September of this year, I was both humbled and thrilled when the church voted me in as their senior pastor. As I think about the future and the new ministry that God has given me, I want to share some reasons that I am excited to pastor Grace Baptist Church. A Dream Come True—When I yielded to Jesus as a teenager, He began to change my desires. I used to want to be in law enforcement. God began to change my desires as I followed His leading. As I entered Bible college, the greatest desire of my heart was to be a pastor. I realized that God had a lot of work to do in me before He could work through me as a pastor, but the desire was still there and growing. I like how Paul said it in 1 Timothy 3:1 “This is a true saying, if a man desire the office of a bishop, he desireth a good work.” God has granted me that desire and I praise Him for it. 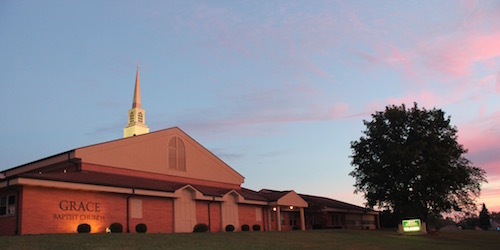 A Great Church—Grace Baptist Church has been a part of the Kettering, Ohio community since 1983. It is an established church with a heart for missions and it’s community. I am constantly blessed as I watch members following God’s direction in their lives and seeking to serve Him faithfully. I truly believe that the brightest days of Grace Baptist Church are still ahead. Pastoral Longevity—Many pastors come into situations where there has been multiple short-term pastorates. The people are unsettled because they don’t know if the next pastor will stay long enough to get to know him. I am so thankful that this is not the case here. I will only be the third pastor at Grace in thirty-two years. Pastor James Baker pastored Grace for about 21 years, and Pastor Robert Shaw pastored for 1o years. God used both to establish good direction for this ministry, and I look forward to following their legacy of longevity. Unity of Heart—I hear of many churches that have no harmony. Petty matters are disputed between members and a general tension is felt in the body. I could not be more grateful of the unity that is present at Grace. I fully realize that this is a work of the Holy Spirit as the members yield to Him. To the members of Grace Baptist Church, thank you for allowing this to be true of you. Established Direction—The desire of Grace Baptist Church as a whole is to lovingly stand for Jesus in the midst of a crumbling world. I am grateful that our direction in doctrine and purpose remains firmly set. The Bible is not viewed as a book we judge, but rather the book that judges us. Courageous Men—There is an epidemic in society today of men who will not lead. I praise the Lord for the men of Grace Baptist Church, ones who are striving to live an holy life before God, to lead their families toward God and to serve in ministry for God. I look forward to partnering in the ministry with men such as these. Spirit of Excellence—If it is worth doing, it is worth doing right. Praise God that is the heart of this church. Lets not go half-way for Jesus, lets give Him 110%. A Heart to Follow—Paul said in 1 Corinthians 11:1 “Be ye followers of me, even as I also am of Christ.” Over and over I have seen the people of Grace Baptist Church live this verse out in there lives. What a privilege to pastor a group of believers with this heart! Attentiveness to Preaching—God promises to bless the preached Word of God. I believe that preaching must have the priority in every service. I am thankful that Grace realizes the importance of preaching, and week after week people gather opening their hearts and Bibles to hear God’s Word preached. Clear Purpose—I tend to be a focused individual. Give me a goal and motivate me towards that goal, and it is hard to stop. When I look at the city of Kettering and the many spiritual needs represented, I see much work to do. More people need to be introduced to Jesus. I do not believe that God placed Grace Baptist Church or me in this city by accident. I do not believe that 5 years from now we or our community should still be the same. I firmly believe that we must team together to impact every person for Jesus Christ. This will only happen as we impact the person that God brings into our life today. With Jesus coming any day now, there is much to do, and I desire to be found faithful at His coming. Grace Baptist Church, I am thrilled to have been called to be your pastor and look forward to many more years of serving Jesus together. I ask for your prayers, specifically for God’s wisdom and strength. Thank you for allowing me the greatest privilege of my life! I Love Seeing God Work! 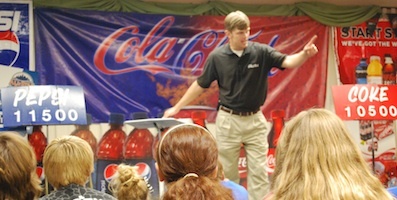 This past week we had the Cola-Clash team come to help us reach Kettering teens for Jesus Christ. I was blessed by the zeal of the team members to recruit as many teens as possible to the three days of carbonated competition. The Lord blessed with record number of recruits and we entered the evening rallies anticipating God to work. He did work. Each night teens came back to receive Jesus as their Savior. Friday night (the final night of Cola-Clash) we gave the teens who received Christ the opportunity to stand and make their decision public. All of them did and what a blessing it was to see them stand unashamed of Jesus Christ. Over the three days we saw ten come to Christ along with 4 other assurance related decisions. I am looking forward to helping these young people grow in their new Christian life. We prayed that God would save teens in Kettering. It was our heart to bring hope into their lives. God did answer our prayer! While we were busy with the Cola-Clash, God allowed a local tragedy to bring many more teens to Jesus. Austin Rife was a 15-year-old young man who was killed by a drunk driver on August 8th. His funeral was on August 15 and while praying with the Cola-Clash team that morning, I felt impressed of the Lord to attend the Funeral. I am glad I did! We had prayed that God would help the preacher to give the Gospel clearly, but I did not anticipate what happened. The preacher, Jeff Rose, stood and gave one of the clearest, timely Gospel messages I have ever heard as well as extended an invitation to receive Christ. The first ones to respond were three High-School young men and then many more teenagers began to respond. They made their way to the front where several personal workers helped them know what to do. I counted around 31 people who responded, most of them teenagers. It amazes me to see how God is able to work and bring people to salvation. He uses even tragic situations to bring hope to many. I am praying that God will continue to work in our city to draw the lost to salvation through faith in Jesus Christ. Please join me in praying for the Rife family as they continue to grieve for Austin. If you have recently received Jesus and desire to grow in your relationship with Him, consider joining our Student Journey Class.